Illustration by Hendrik J. Vos, showing some of Huygens's discoveries (including the ring of Saturn, the pendulum clock, the wave front of light, and the centrifugal force). 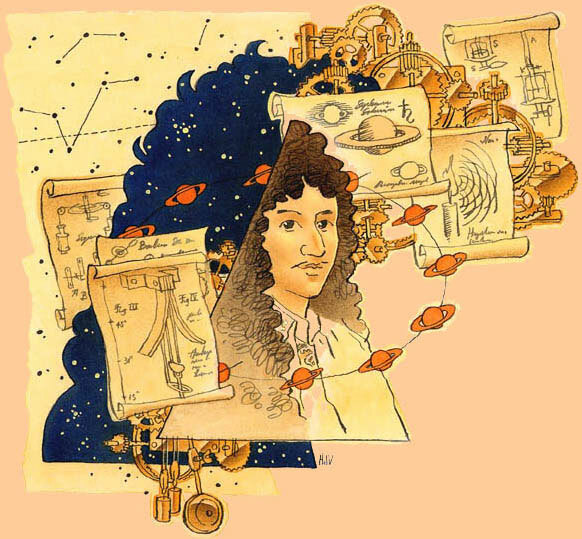 Facets of a genius was the theme of the celebration of the 375th birthday of Christiaan Huygens (born 14 April 1629). Through exhibits and a symposium we commemorated the inventions and discoveries of this Leiden alumnus. Christiaan Huygens entered Leiden University in 1645. His father wanted him to study Law, so that he would be able to keep up the family tradition of government service. Christiaan, however, had little interest in legal matters and switched to mathematics and natural philosophy (physics, astronomy). He studied the work of René Descartes, which was much admired in Leiden, but he insisted on following his own way of thinking about the laws of Nature. After two years his father transferred him to a law school in Breda, hoping to steer his career in a more profitable direction. However, his earlier studies had awakened a love of science that could not be put to sleep. 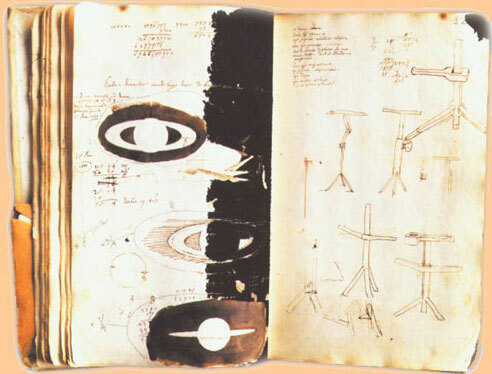 Page of Christiaan's notebook in which he recorded his discovery of Saturn's ring. Much of Huygens's work was only published after his death in 1695, by his admirers at Leiden University. Today his scientific papers (such as the notebook shown here) and many of his instruments (including the first pendulum clock) remain in Leiden, as a tribute to this uniquely gifted alumnus. One of our physics laboratories has been named the Huygens Laboratory in his honor. 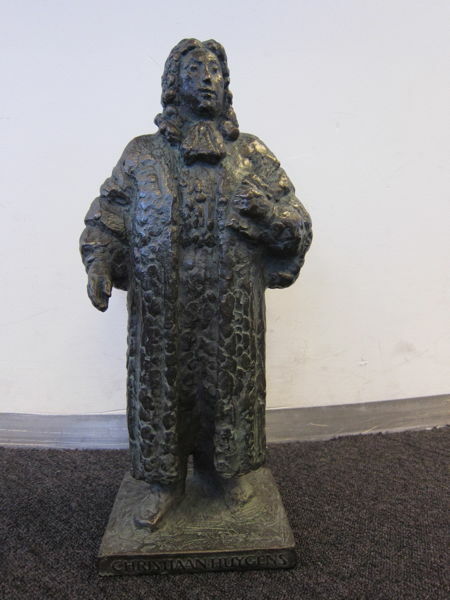 Bronze statue of Huygens by Frank Letterie, donated to our Institute by Bernard van Heck, who received it when he won the 2016 Christiaan Huygens Science Award for his PhD research.